An anxious cub drives his father a little crazy with the anticipation of his big day. 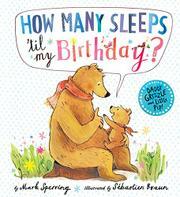 Daddy Grizzle is roused from a sound sleep by Little Pip, who announces, “Today is a very special day….my birthday!” This gets Daddy Grizzle out of bed in an instant; then he realizes that it’s not Little Pip’s birthday after all—that’s not for another “THREE whole sleeps.” Since they’re up, they go out into the woods to gather some branches and twigs. The next morning, the same thing happens; Daddy Grizzle rushes out with a basket, then remembers. Little Pip follows, and they fill their baskets with “the most beautiful things” in the woods. When Little Pip wakes up the next day, he remembers and asks, “how many sleeps ’til my birthday?” Daddy Grizzle is able to tell him, “tomorrow.” So when they go into the woods, it’s to hand out party invitations. On his birthday morning, when Little Pip wakes, it’s to a tortuous, marked trail, at the end of which is a glorious birthday party. Next morning, he wakes Daddy Grizzle up with the question, “How many sleeps ’til Christmas?” Sperring gets high marks for depicting a nurturing, apparently single father, but the story is rather static. Braun draws adorable animals and colorful forests, and that’s probably enough to get birthday-obsessed youngsters through the book.